In the nearby forest, the father of Mr Lavoué found a few days later a booklet with some curious hand writting but without the name of its owner ! He could read that the owner was with General Spark and Doolitle for a lunch. Who was the owner of this booklet ? The booklet was given to a US senior officer and M. Lavoué swore on the Bible that nobody else read 6the booklet. " The war would be different " say the senior officer. The owner was Major Barthold (the Intellingence Officer – at each mission there was one). In total, we count ten airmen dead, one survivor : a total of 11. Who was the twelfth dead found, not from the crew of B17 # 42-229476. >From which B.17 ? During the May 29th raid, the formation of Rennes lost 4 or 5 heavy bombers around Dinard, St Malo and about thirty airmen were buried at Dinard at the same time. They were transfered in 1946 to the US Military Cemetery at St james (Manche). 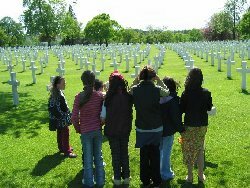 A lot were transfered later to rest in peace with their families in the States.